Mazza-Dixon (18th century popular music) and Ken Chichester and friends (a glimpse into lives of Civil War soldiers) for their excellent presentations. This was the 7th year we have presented the series for your enjoyment and education. 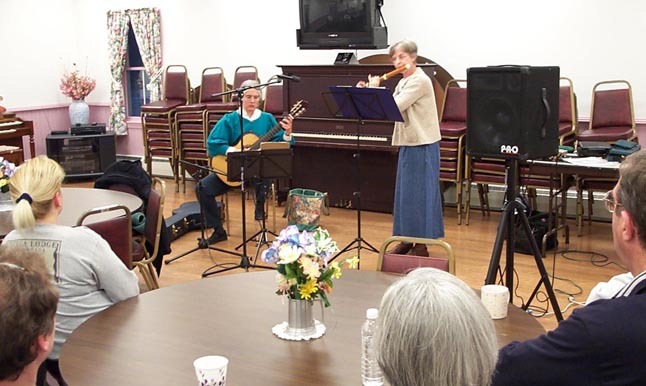 Photo above- About thirty people attended a music program sponsored by the Historical Society on 18th century popular music with Linne Landgraf on Baroque flute and Laura Mazza-Dixon on classical guitar on April 9, 2004. This was the third in our four program lineup which concluded on May 14 with A Glimpse Into the Life of Civil War Soldiers with Ken Chichester and company.